California: It was the third time in six seasons the Golden Bears won a first-round game in Waco and then had to face Baylor. They lost by 19 points in 2014 and fell by 40 two years ago. … Anigwe’s early fouls changed how aggressive she could be — at least for a few minutes. She had two more fouls in a 22-second span early in the third quarter and came out of the game briefly, but the game was already lopsided by then. Baylor: The Lady Bears won their 16th consecutive NCAA Tournament game at home, all of them pretty much by lopsided margins. They finished 17-0 at home this season, and have won 39 in a row overall in Waco. … Baylor, going to its 14th Sweet 16 overall, needs two more wins to get to its first NCAA Final Four since their undefeated 40-0 national championship in 2012. 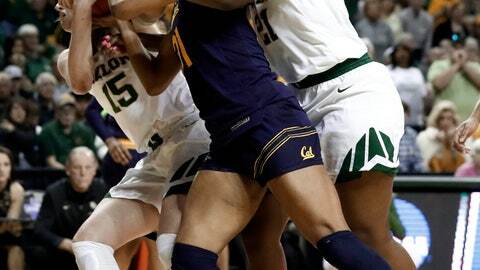 … The Lady Bears already have wins this season over four of the other teams in the Sweet 16 — UConn, South Carolina, Arizona State and South Dakota State.